Let’s be more precise. 13.4 billion years ago in a galaxy at the edge of the known universe, some light started a journey that recently ended when it hit the mirror of the Hubble Space Telescope. An international team of astronomers, of which I am a member, has identified that this light came from the most distant galaxy that has ever been seen by humans. 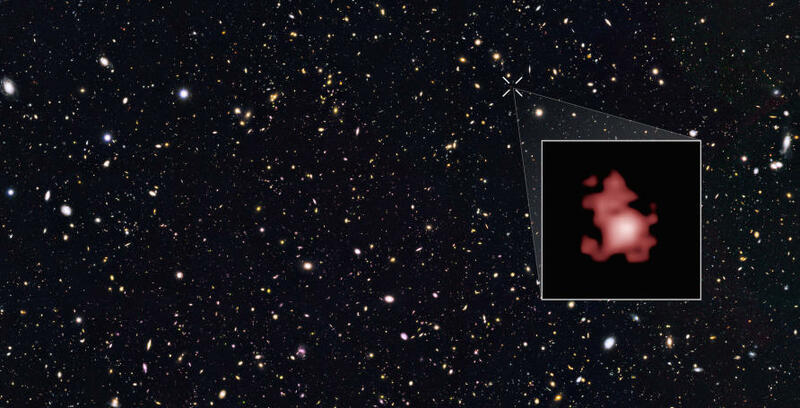 The object – named GN-z11 – is so distant that the light from the stars in that galaxy took about 13.4 billion years to reach us. This is about 200 million years longer than the previous distance record holder. The difference between 13.4 and 13.2 might seem a relatively small gain, but it is not so. After all, the Universe is only 13.8 billion years old, so this means that we have been able to observe a bright and massive galaxy – containing about one billion stars – when the Universe was only about 400 million years old. This is a 50% improvement over the previous frontier, which was probing galaxy formation when the universe was 600 million years old. The further into space we look, the further back in time we are seeing. This is because of the finite speed of light. When we receive a letter in the mail, we read information that was written in the past. Similarly, when we observe a distant object, we see it as it was in the past. The “slowness” of light (300,000 km/s) is barely noticeable on Earth. The light travel time between Melbourne and London is only 0.05 seconds, but it starts to become significant within our own Solar System. For example, the light from our Sun takes about eight minutes to reach us. When NASA communicates with the New Horizon spacecraft, which recently took amazing pictures of the dwarf planet Pluto, the one-way time lag is about five hours. The Hubble Telescope brings this game to the extreme, and can collect light from faint sources all the way back to the youth of the Universe. So we might say that Hubble is the astronomer’s own Tardis. 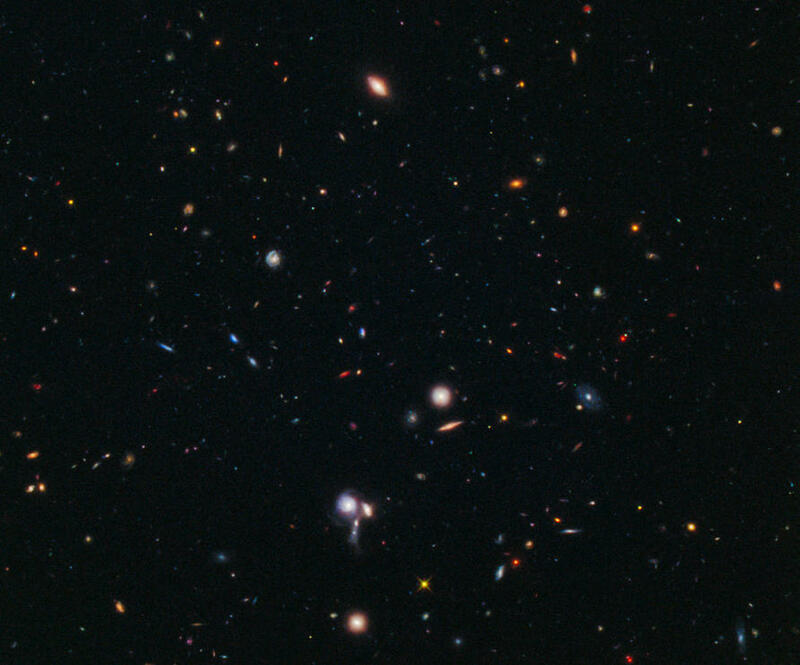 Even with the amazing sensitivity we get with the Hubble Telescope, identifying the most distant galaxies is still a very challenging enterprise. 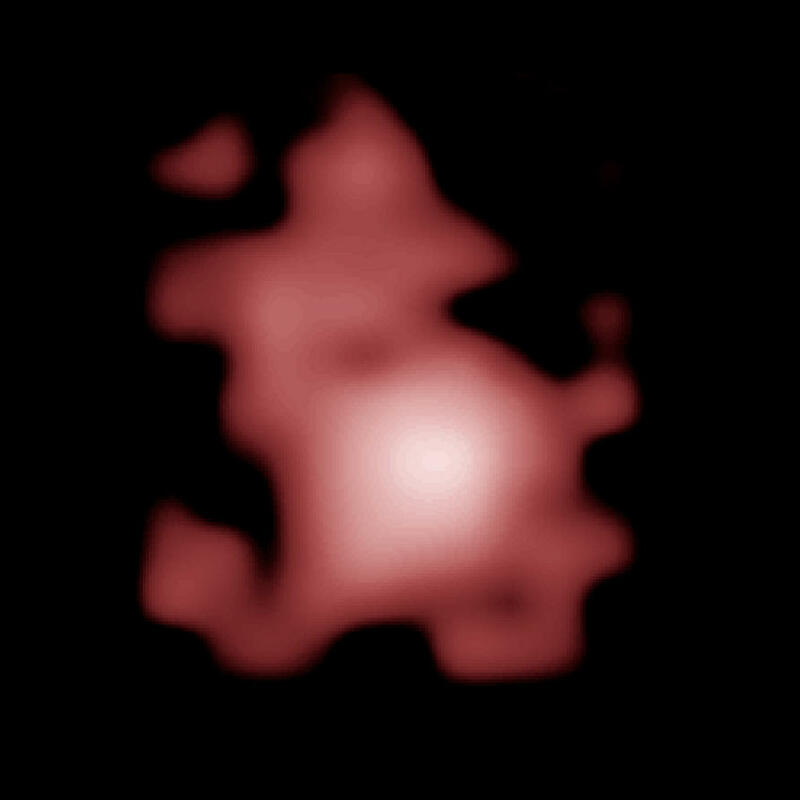 These objects are so faint that they appear as tiny red dots in images that contain thousands of brighter and closer galaxies. It is literally like searching for needles in a haystack. Hubble’s camera was upgraded in 2009, giving us the opportunity to identify an unprecedented number of candidate galaxies, within the first 800 million years of the Universe and whose light therefore travelled for more than 13 billion years to reach us. Before this, we only knew of a handful of galaxies from this far in the past. Today, we have almost a thousand candidates, which we identify based on their colour and shape. However, to measure the precise distance of these, we need to take a spectrum; that is, we split the light into its component colours. So far, we have only managed to do this successfully in a dozen cases. The large majority of other candidates have a large uncertainty of a few hundred million years, and some are probably what we call an “interloper”, a galaxy that is much closer to us but with colours similar to those of the most distant galaxies. I am amazed that GN-z11 turned out to be so distant. 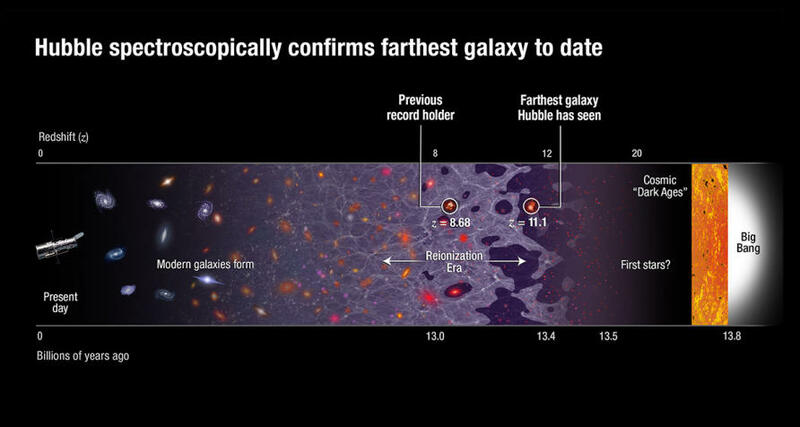 When our team proposed using Hubble to take a spectrum of this galaxy, we were expecting it to be from about 13.2 billion years ago, comparable to the previous record holder. We were not expecting a galaxy as big and bright as GN-z11 to exist just 400 million years after the Big Bang. We assumed it would be closer to Earth, from when the Universe was older and more evolved. Instead, we found that it is at the farthest end of the range, at the edge of what Hubble can observe. Having a galaxy with a billion stars present just 400 million years after the Big Bang is astonishing. So what does this finding mean about what happened during the early Universe? Did stars and galaxies form differently than they do today? This question will no doubt keep us astronomers busy at least for the next few years. Frontier science is often a walk through the dark with only a faint candle to guide us. While we are confident in the final result, which has been accepted for publication in the peer-reviewed Astrophysical Journal, pushing the technology to its limit means we encounter a lot of noise. My colleague, Professor Rachel Webster, told me she would like to see less noise in the data, although she stressed that this was a “must publish” result. I fully agree with her. This highlights how science lacks absolute certainty, and how all results are quoted only to a given level of confidence. This small patch of the sky is one of the places where we pointed the Hubble Space Telescope to search for super-distant bright galaxies. Credit: NASA, ESA, M. Trenti, L. Bradley and the BoRG team. Now we want to know what other galaxies from this time period look like. Our team in Melbourne, in collaboration with international partners, is currently carrying out a survey using the Hubble Telescope to find similar objects at cosmic dawn. We call this the Brightest of Reionizing Galaxies (BoRG) survey. Even with new data, Hubble has its limits, and it is impossible to collect light from objects more distant than GN-z11, because their photons lose energy during the long journey to Earth and are shifted too much into the infrared. However, observations with the James Webb Space Telescope (JWST) are just around the corner. JWST, which will be launched into space in 2018, will be much more powerful than Hubble, and be able to observe farther into the infrared, which is crucial for seeing distant red-shifted galaxies. With JSWT, we will be able to study galaxies like GN-zn11 in much greater detail and look even further back in time. Who knows what new mysteries we will stumble upon. What happens after water tanks are installed for communities and the NGOs leave?